A bit of a whimsical purchase on Friday lunchtime led to a wee weekend trip to St James’ Park for some Premier League football. I’d been to Newcastle for football before but for the Olympics in 2012, so it was good this time to see the place in its lop-sided Premier League finery. The Crystal Palace fans were in noisy voice from the off, and they got a little louder precisely 32 seconds into the match. 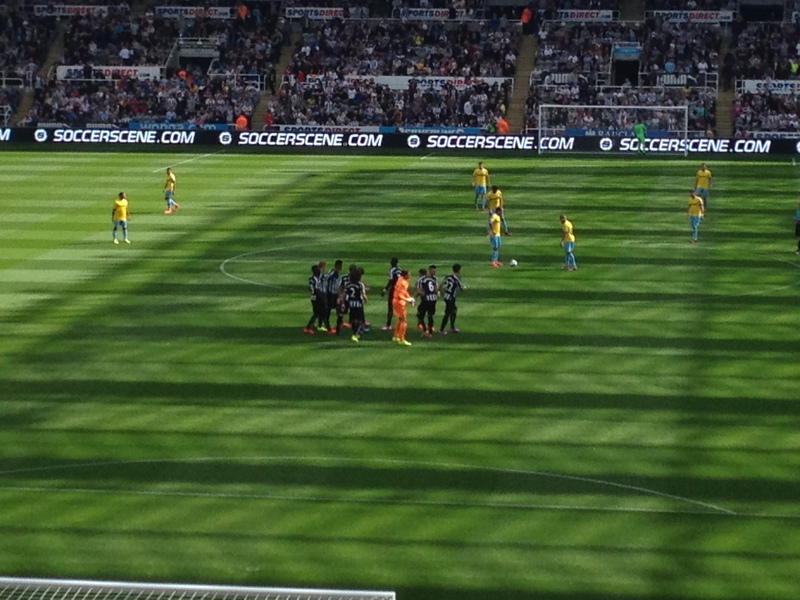 Straight from the centre, Newcastle stood off the Palace attack leading to a shot from Marouane Chamakh. 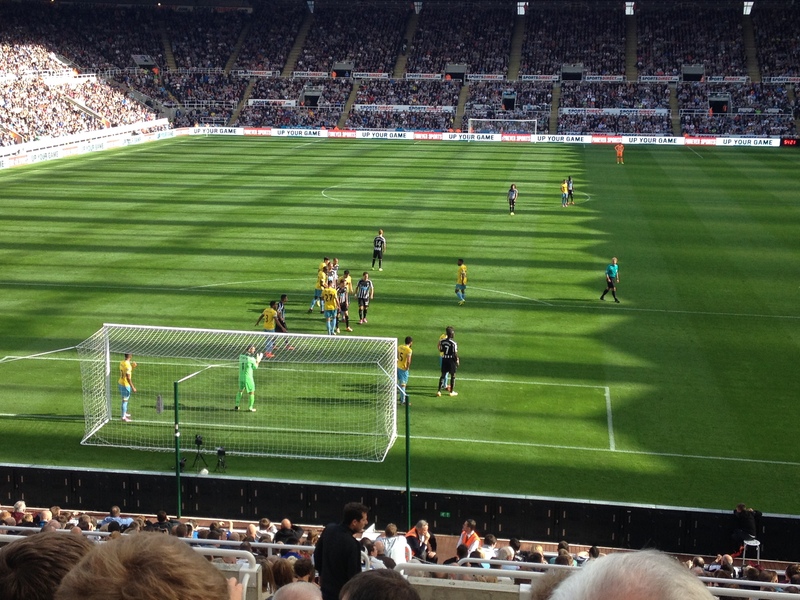 The shot hit Tim Krul’s left upright, and the rebound was poked in by Dwight Gayle. A large proportion of the remainder of the first half saw United being very static, dominating possession and calmly knocking the ball around, but doing very little going forward. Daryl Janmaat had looked Newcastle’s best player, and in the 38th minute the Dutch right back provided the equaliser. A driving run into the area, cutting in from the right, from the Dutchman led to a shot which Speroni saved. The rebound fell via a bit of a richochet to Janmaat’s feet and he happily stuck the ball in from close range. 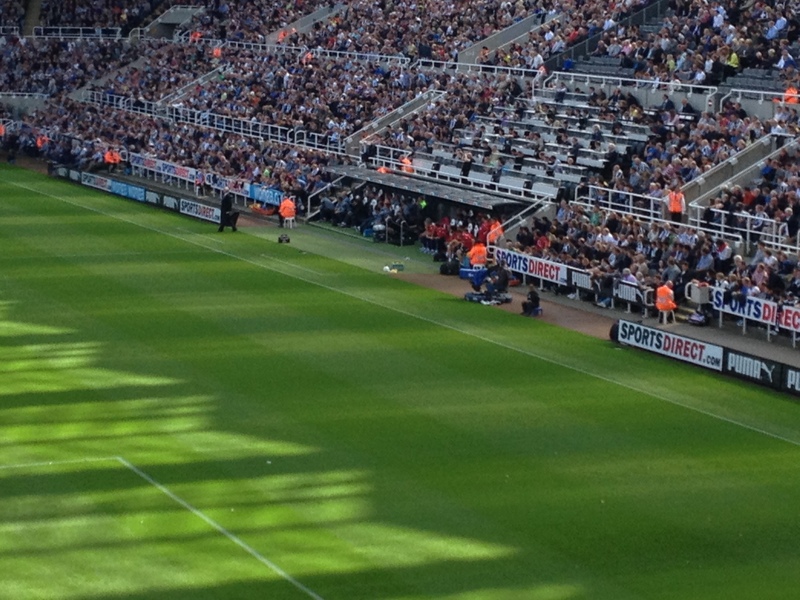 Despite the positivity of the Newcastle supporters at the break, the second half began much like the first. This time three minutes in, following some shoddy home defending, the ball broke kindly to the wildly inconsistent but still patently capable of good things Jason Puncheon. His left-footed volley flew past Tim Krul into the bottom corner, giving Palace their one goal advantage back. Probably the decision Alan Pardew will be most pleased about lookiong back on this match will be his decision to bring Rolando Aarons, the 18-year old Jamaican born winger, on for Yoan Gouffran after 67 minutes. After that change, Aarons suddenly brought some creativity and urgency to his side’s previously pedestrian forward play. The youngster, who has seemingly declared for England rather than his homeland, equalised in the 73rd minute. Newcastle’s 10th corner of the day was the first one that had worked to any degree, and Aarons’ glancing header drifted gracefully past Speroni into the top corner. The Magpies then took the lead for the first time in the match, with Aarons again providing the necessary magic. His half-cross, half-shot from the left Speroni stranded, with Mike Williamson on hand to bundle in his first ever goal for Newcastle with only 2 minutes left of normal time. I mention normal time because when the 90 minutes were up, the referee added 7 minutes of stoppage time. The Geordie fellow sitting to my left agreed with me that it was about right, though mostly it had been time added for Crystal Palace injuries. In the fifth minute of the seven, Crystal Palace had a set piece in the middle of the Newcastle half. As so many times before in the game, the ball was teed up for a back-post knock-down, and returning on-loan hero Wilfried Zaha was on hand to fire home and give Crystal Palace the point they probably deserved. 3-3 it finished – rather good value for my last-minute £27 purchase. As an aside, it was quite fun seeing the vanishing (or “imaginary”) spray in action for the first time – again those around me in the Leazes End thought it was a worthy addition to the game. It would also be worth folk keeping their eyes on Rolando Aarons – a few more performances like that and I can imagine the Toon faithful taking him very much to heart. Kudos also to the Crystal Palace fans, who barely stopped belting out songs the entire match, in surprising contrast to the home supporters. 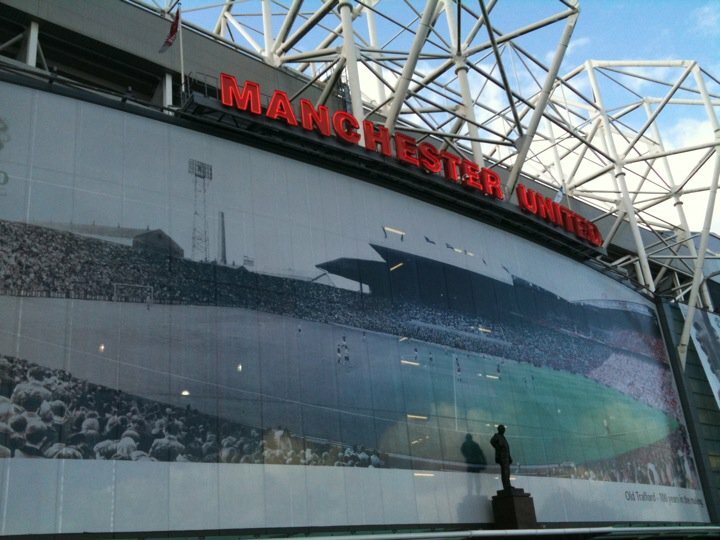 Will Louis van Gaal bring happier times back here? Disclaimer – I started this post on 4 August. Since then work has been a bit mad, and obviously the Premier League season has started. So rather than go into analysis about each team, I’ve just decided to print the table and be done with it. The table was also done pre-Pulis’s resignation but frankly I think I’ll just stick to my guns and hope for the best.